Joining thousands of Rohingya Muslims already in Cox's Bazar, they cleared forests and built shelters from mud and bamboo to create a sprawling mass of camps that now house more than 900,000 people, of which 80 per cent are women and children (Photo: DIBYANGSHU SARKAR/AFP/Getty Images). In hotels and restaurants near the beach at Cox’s Bazar in southeast Bangladesh, international and local aid workers sent to help the Rohingya in the world’s largest refugee settlement talk nervously of the major challenge ahead – the weather. Joining thousands of Rohingya Muslims already in Cox’s Bazar, they cleared forests and built shelters from mud and bamboo to create a sprawling mass of camps that now house more than 900,000 people, of which 80 per cent are women and children. But while life in the settlement has started to stabilise, aid workers said they were rushing to secure the camps for the longer term with no sign of the crisis ending and one factor hanging over them – the monsoon in May then cyclone season. UN special rapporteur on human rights in Myanmar, Yanghee Lee, said on January 25 it was clear the Rohingya cannot return “in the near future” with the situation unchanged and Myanmar still denying all accusations of persecution. “The Rohingya are stateless and had been suffering back home. Some talk about the freedom they have here,” said Al-Khateeb, whose organisation is frequently quoted saying the average length of stay in a refugee camp is around 15-20 years. Another programme, run by the UN’s Food and Agricultural Organization (FAO), International Organization for Migrants (IOM) and WFP, is supplying all households with stoves and a monthly canister of LPG to reduce pollution and deforestation. 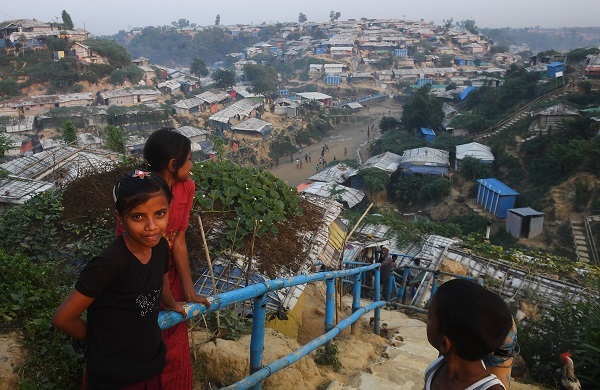 Last year UN agencies and NGOs launched a $950.8m appeal to provide essential humanitarian assistance, including to nearly 400,000 Bangladeshis in nearby communities, some of whom are as poor as the Rohingya, in a bid to diffuse tensions. A new funding plan will be launched later this month, with initial drafts of the proposal, seen by the Thomson Reuters Foundation, showing the target will be about $920m.